What is Invisible Ink Pen? 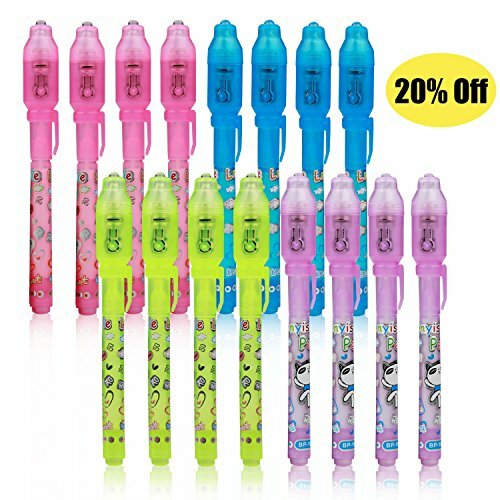 The invisible ink pens are very popular around people, which can creat a lot of fun. People can use it to communicate secrectly and hide messages. Children think that they are secret agents with these pens, lay mystery adventures and writing clues for each other. You can make secret spy messages with your friends. The pens also can be used widely. Perfect for the RSVP's to wedding invitations, Goody bags for kids spy party, Make a fun party favor, For Drawing, Secret Message Writing, Currency Checking, Security Marking. which really bring happiese to all of us. So get it to have more fun with your families and friends! -Recommended quantity,16Pcs is good for Birthday party goodies,Halloween goody bag and so on.Inadditional,individual package is perfect as gift to each kid. -A great gift for spy detector. WRITE YOUR SECRET MESSAGE: The ink is invisible after you write with it, only when you shine the light on the message you will reveal the secret behind...Bring fun for kids. INVISIBLE INK PEN: Built in UV light on the cap of pen. Button cell batteries included and installed. Pens will come in four colors plastic for kids' choice (Ink is the same color). SAFE INK FOR KIDS: Flavorless and non-toxic ink. It can be wrote on T-Shirts,paper,skin! Durable but washable! (PLEASE DO NOT use on some special surface, like: glass or smooth plastic film, etc; it will influence the effect, and easily to be erased. PARTY THEAM & FUNNY SPY GAMES: Kids love using this kind of pen to keep their secret and play detective spy games. Invisible pen brings you an amazing variety of fun activities. For Surprise birthday parties, or writing a top secret message to their parents or grandparents. WHAT YOU GET: Pack of 16 invisible ink pens, worry-free warranty and friendly customer service. Contact us for any reason if you are not completely satisfied with our product. If you have any questions about this product by WYAO, contact us by completing and submitting the form below. If you are looking for a specif part number, please include it with your message.